Here in “America’s Finest City,” along with the rest of California, medical marijuana has been legal for over twenty years, yet the presence of medical marijuana dispensaries has been sparse due to the 2010 San Diego Medical Marijuana ordinance (amended in 2011, 2014). This ordinance allows for a small maximum number of dispensaries allowed citywide, organized by council districts. Zoning regulations, however, have made it very difficult for dispensaries to open and for candidates to work San Diego marijuana dispensary jobs. Thanks to an erasing stigma toward marijuana, a movement rallying for more dispensaries to legally operate is gaining momentum and people are listening! As more Californians become aware of the medicinal benefits of cannabis, as well as its safety as a recreational adult substance, a growing interest in finding employment in San Diego marijuana dispensaries is evident. As city regulation continues to be modified, it’s helpful to know what San Diego marijuana dispensary jobs look like. Budtending is a much sought after “entrance” into the world of weed. These San Diego marijuana dispensary jobs combine customer service responsibilities with in-depth knowledge of cannabis products, strains and methods of consumption. Budtenders take their passion for cannabis and bring it to the dispensary counter everyday. They offer helpful advice to patients and customers, advising which products are most suited to fit their medical and recreational needs. This position is an excellent springboard when pursuing more advanced careers in the marijuana industry. The sort of hands-on experience that is expected from this job helps to develop a knowledgeable, personable cannabis industry employee with a well-rounded knowledge of all things marijuana. Budtenders often start at an hourly wage somewhere between ten and fifteen dollars plus tips depending on experience. Seasoned budtenders and supervisors receive raises on a sliding scale, but seldom more than twenty dollars per hour. Receptionists allow for dispensaries to run smoothly thanks to their administrative and customer service responsibilities. Receptionists process and store customer identification information in online databases and help to answer any questions about San Diego marijuana regulations. Especially in smaller dispensaries, budtenders and receptionists will likely work both jobs, as they both require similar customer service responsibilities. Often times, new employees will start out as receptionists, and consistently gain more budtending shifts as their experience and comfort in a dispensary setting surges. This is another position where the pay begins around minimum wage and can vary by a couple dollars per hour. Since this job is perhaps the most entry-level position in the dispensary, compensation can be modest at first. Dispensary management is an involved job that requires applicants to have years of relevant experience not only in management, but cannabis industry supervision. Managers not only interview and hire new employees, they also train and educate subordinates on all things dispensary related, including but not limited to strain differences, current legislation and guiding customers through a sale. It’s important not to underestimate just how important it is to have an excellent dispensary staff. Managers do their best to facilitate a prosperous business and a rewarding individual career for every employee. Dispensaries are just as recognizable by their products as they are by their staff. Dispensary manager compensation operates on a competitive pay scale as owners are looking to find consistent management who will stay with the business for an extended period. Dispensary Owners are knowledgeable members and business players of the cannabis world, investing capital into an industry they hope will give back to them and their employees. Owning a dispensary requires a thick skin and patience. Especially in San Diego, there are many hoops to jump through in terms of obtaining the legal right to open up shop in certain districts. This part can get tricky: not only are there a limited number of openings available for dispensaries per district, there are intersecting zoning laws that require space from other shops and schools. With a competitive landscape forming between marijuana dispensaries statewide and in San Diego, the appeal of marketing and design contractors is making itself apparent with increasing dispensary advertisement and branding. Graphic and web designers, as well as marketers and social media managers highlight elements that help dispensaries stand out a individuals, instead of being just one in a sea of many. 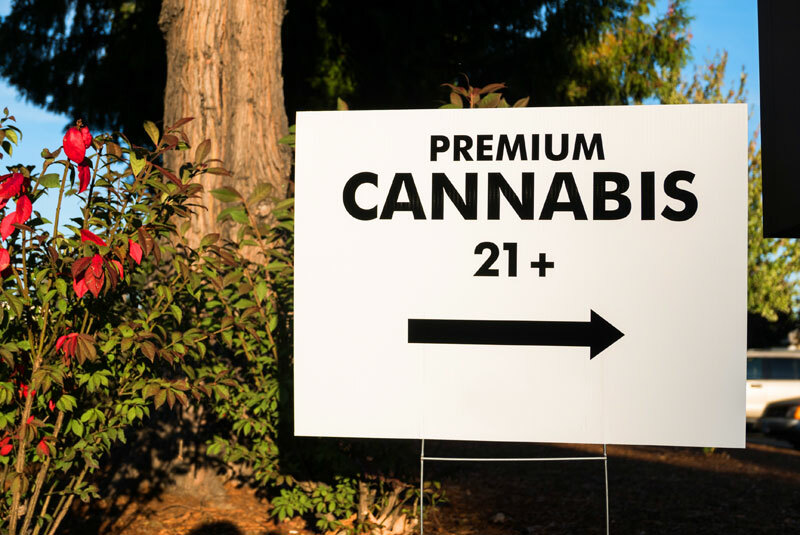 An effective marketing team helps to make a dispensary appealing and unforgettable thanks to unique branding, product deals and social media presence. One of the greatest benefits of the booming marijuana industry is how it engenders job growth in related and associated fields. For instance, dispensaries have helped heightened demand for IT assistance, as well as security and other forms of safety and protection online and in store. When it comes to the products sold in marijuana dispensaries, you may be wondering where such an extensive array of different cannabis products comes from. Dispensaries make partnerships with other cannabusinesses such as concentrate and edible creators who use extraction techniques to create potent, tasty products that are then distributed to different dispensaries. This same concept can be extended to glass merchants and other artisans who sell their wares at dispensaries, sharing individual profits with the business. How Do I Obtain San Diego Marijuana Dispensary Jobs? Acquiring San Diego marijuana dispensary jobs is deceptively difficult given the “chill” culture associated with marijuana. When seriously considering applying for one of the positions detailed above, make sure to first and foremost be aware of the responsibilities associated with individual jobs and formulate an application based on your qualifications. For all San Diego marijuana dispensary jobs, it is key to possess (and deepen) knowledge of all cannabis products, consumption methods and local and state legislation. Though budtending and reception jobs require the least up front qualifications, employers are still seeking individuals with direct marijuana experience, or at very least, a wide range of knowledge regarding everything about the plant. Another hallmark of San Diego marijuana dispensary jobs qualifications is customer service experience. Hiring Managers will often reference in job postings that if applicant do not have direct marijuana sales experience, they should at least have some sort of bartending or barista experience. Though the products are obviously very different, experience as a bartender is perhaps the closest position to a budtender, (hence the name) so be sure to highlight any experience in that field. For better or for worse, the answer I’ve been coming across most frequently when inquiring about how people can get hired in dispensaries is that it’s all about who you know. I’m sure you’ve heard this before anytime you’ve applied to virtually all other industries; however, this sentiment rings especially true in the marijuana industry. This is generally because employers are looking for reliable people they can trust in this highly scrutinized business, which is hard to obtain in a short one on one job interview. If you’re wracking your brain and can’t think of any friends in the business, don’t lament your chances just yet. First of all, this is not the only way to obtain a job, though it helps. Another thing to consider is inquiring to your local budtender or receptionist at you neighborhood dispensary. this is a valuable thing to do in general, as employees have valid experience finding a position and a lot of knowledge to back up their opinions on the matter. By making yourself a consistent presence in San Diego’s dispensaries, you are raising your personal level of accountability to shop managers and owners, so long as your behavior in store is appropriate. As San Diego’s cannabusiness continues to develop and grow, more opportunities will make themselves apparent with an influx in demand for cannabis products. If your eye is set on a marijuana dispensary, make sure to be current on all legislation by visiting ca.gov and observing San Diego’s municipal regulations.